American Express have this advertising campaign going on. Every time I open a newspaper or pass an Amex billboard, I do a double-take. Perhaps this isn’t happening to people who are not called Daniel. Please note: This Daniel does not recommend or endorse American Express products. They’d have to pay me first. 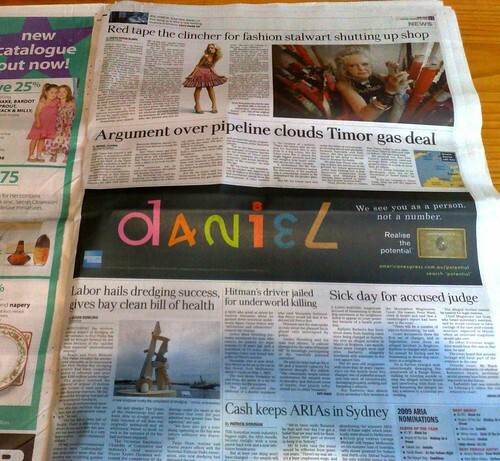 Every time I read that newspaper ad I shout ‘my names not Daniel you stupid American Express!’. I’d much prefer they called me by my number than an incorrect name. I saw the ad on a bus shelter. Thought I must take a snap next time. Brian, wouldn’t it be clever if they could hack a newspaper’s subscriber list and insert an advert with the given name on it! I noticed it on Friday, it appears that it is the only name they have done, but I like it! I saw another financial ad in Heathrow airport and it had ‘the world according to Daniel’ on it. I don’t think it was AE though. I wonder if it’s a name the advertisers have determined is good for putting in ads. I wonder if Amex (and any other companies doing this) will notice a higher-than-usual proportion of Daniels signing up?